Riley and the Curious Koala is the third in the Riley series of picture books. Riley’s first adventure began in Beijing with Riley and the Sleeping Dragon, continued on to Hong Kong with Riley and the Dancing Lion, and his latest adventure brings him to Sydney Australia. 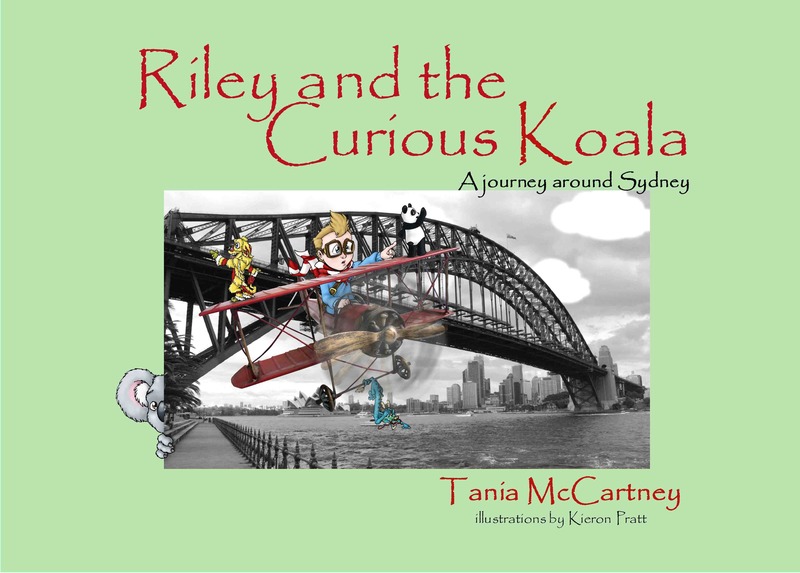 To celebrate the launch of Riley and the Curious Koala, author Tania McCartney has set off on a blog tour. You can check out the other stops on her tour if you scroll to the bottom of this post. She’s here today to talk about how to come up with good ideas for writing stories. This is such an interesting question! Least of all because it’s such a hard one to answer. Everyone gets their story writing ideas in different ways—and many authors will tell you it’s from the everyday happenings in their life—boring but true. From opening a yoghurt pot to tripping on a rug … these are the things that inspire an active imagination. And yes, they’re also the things that inspire me. Imagine, if you will, opening that yoghurt pot and finding something other than creamy white yoghurt inside. Perhaps it’s a pot full of centipedes. Or a tiny white rabbit. Or a strange green slime that pours out pink smoke. What kind of story could unfold from such an opening? These everyday occurrences can really spill over with story ideas if you just open yourself to the possibility … and think outside the square. But you know what—sometimes it’s hard to think outside the square when you’re young and life experience hasn’t twisted your brain into a mangled wreck of crazy thinking. 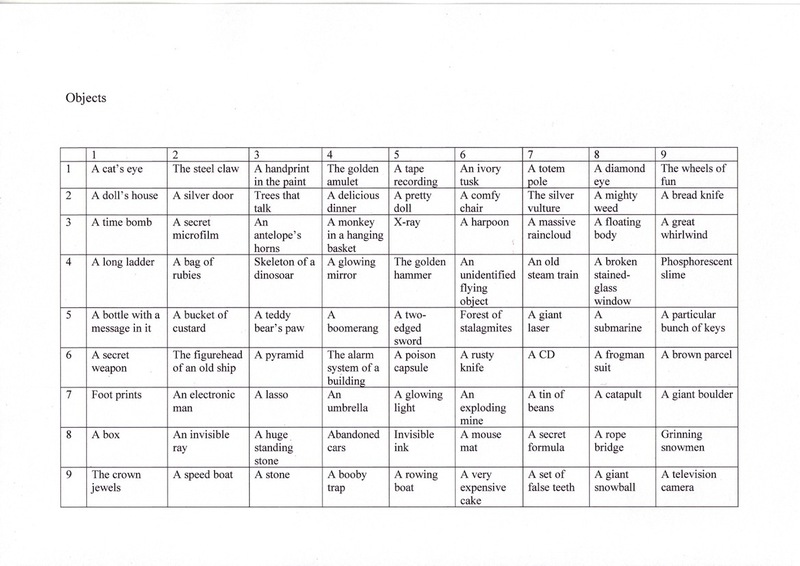 There’s also those Parent and Teacher expectations—the pressure of coming up with something marvellously creative. 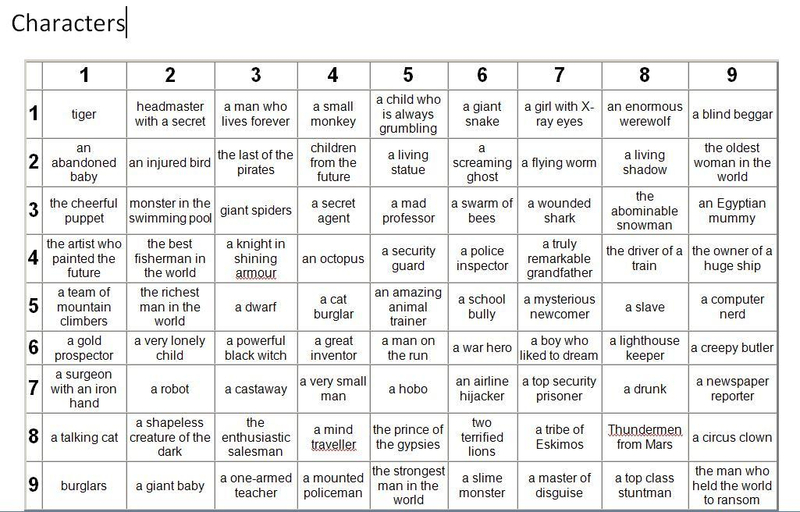 So I’ve come up with a little exercise that will help you create a fantastically imaginative story that will ooze out of you like taffy. We all know the basic storyline structure—yes? Basically, there’s a beginning, middle and end. Got it? Great. Then there’s the details. First of all—the setting or the place. Where is your story going to take place? Then we have to think about characters. Who is involved? Who are the main players? Next is a situation. What is actually going to happen in this story? It helps if we add an object that becomes the focus, along with the characters, in making a story come to life. The other thing we need to consider is conflict. Conflict means making something troublesome or difficult for our characters. Changing things around, making them do something or work towards something. One of the easiest ways to do this—as with my Riley travelogue books—is to make them search for something. Characters often search for something in books, even if it’s not an actual object. It’s a common recurring theme. When a character searches for something, you can put in as many cool plot twists and problems as you like. Plot twists, problems, drama, conflict—that’s what makes a story interesting—and makes people want to read your story. Nothing worse than writing a story no one wants to read. So—here’s a challenge for you. I want you to write a story—an adventure story where someone is searching for something. And here is how you’re going to do it. Once you have written down your four basic elements, you now need to construct a short story using these references. So, for me, I need to write about a tribe of Eskimos hunting for a forest of stalagmites in a haunted house. And plastic surgery will need to be someway involved in order for me to find those stalagmites. You have just 20 minutes to write your story. Make it fast and off-the-cuff so you don’t think about it too much. Then, if you want to—why not email it to Soup Blog (or to me for Kids Book Review!) to be published online, so we can revel in your cleverness. 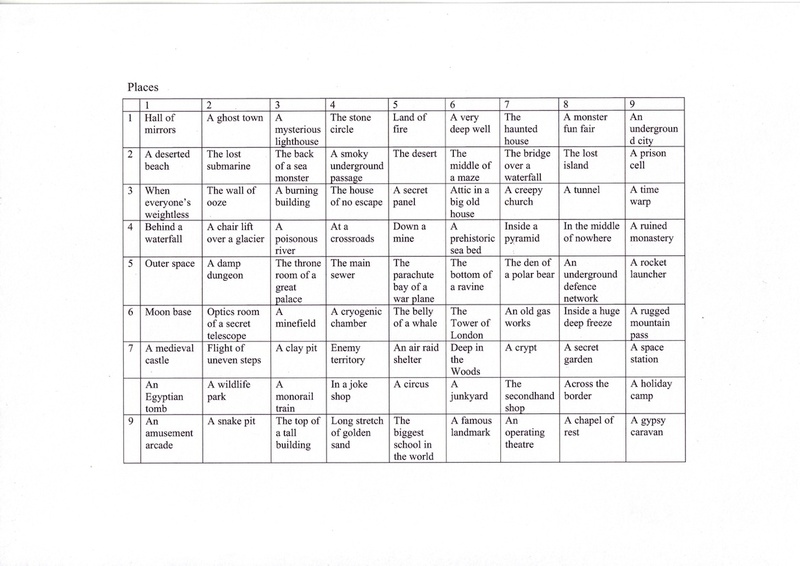 You can also ask your teacher to run this challenge in your classroom. You might surprise yourself how creative you can be when writing this story. Remember to throw in conflict along the way and to resolve the story at the end … will your character(s) find what they are searching for? I, for one, would love to see what you come up with. 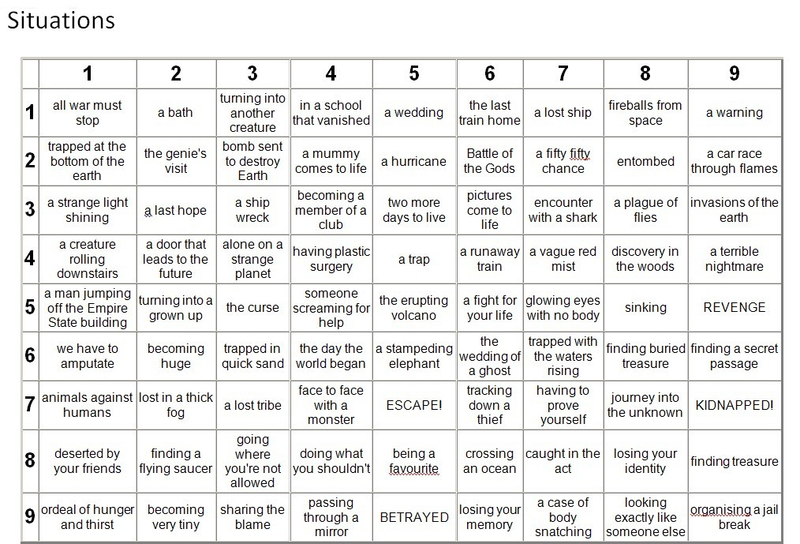 Use this story writing grid often to challenge that wonderful imagination you have hiding inside your head. And do let me know when your first book is published, will you not? Tania McCartney is an author, editor, publisher, blogger, book reviewer and mango devourer who loves writing, celebrating and supporting children’s literature—and literacy. She is the author of the Riley series of travelogue picture books, as well as several published and self-published books. 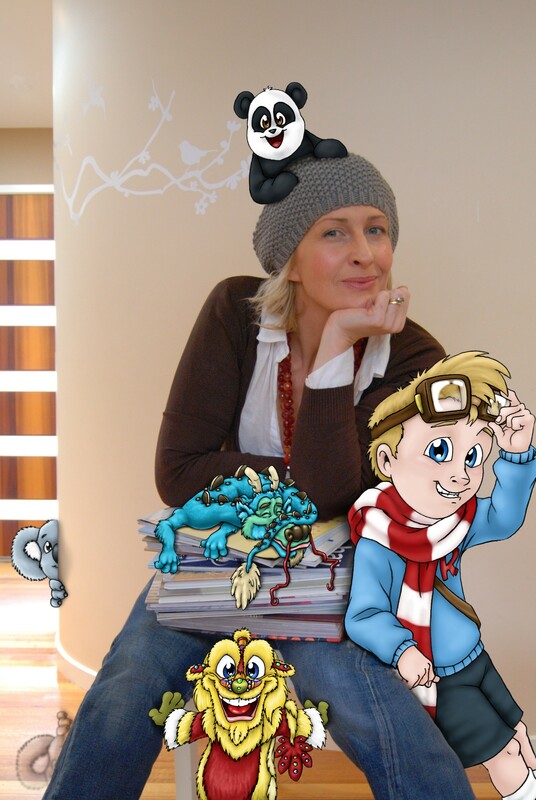 Tania is also an experienced magazine writer and editor, is the founder of Kids Book Review and is a Senior Editor at Australian Women Online. She lives in Canberra with a husband, two kids and a mountain of books. Enter Tania’s colouring-in competition to win your own copy of the book! EXTENDING YOUR BRAND and BOOK GIVE AWAY! LIVE QUESTION TIME WITH TANIA! RilEY AND THE CURIOUS KOALA BOOK GIVEAWAYS! Be sure to stop by on Thursday—Tania McCartney will be visiting. She’s on a blog tour to celebrate the launch of the third book in her Riley series. On Thursday she’ll be talking about how you can get those story ideas flowing. Get your pen and paper ready and we’ll see you then!